Let us face reality, whereas environmental regulations continue to restrict the use of fluorine, no solution could bring so far an efficient alternative to fire fighting. UNITEQ is convinced that a thoughtful management of fluorine could enable a more responsible use of this chemical and contribute to moderate the regulatory pressure. Encapsulation, recycling and clean up are at the heart of the preoccupations and developments of the enterprise. UNITEQ, via its BSX eco+ range equipped with upgradable cartridges, offers to accompany his customers towards a greener, more sustainable solution and to anticipate the future extinguisher market evolutions. Fluorine – An increasingly punishing regulation! The regulatory pressure on fluorine is quite severe and likely to be further enhanced. In 2006, the document EC/2006/122 has restricted the presence of PFOA’s to maximum 0,005%. In 2010, EPA has imposed a reduction of 95% of PFOA’s, which has initiated the use of shorter chain foam additives (C6). Existing information shows that short chain compounds (C6 and less) display a reduced impact with respect to toxicity and bioaccumulation. Since its foundation in 2010, UNITEQ has used exclusively short chain (C6) fluorine derivatives and has based all its formulations on new generation fluorine derivatives with concentrations in line with the requirements expressed by Milieukeur environmental label, whenever feasible. In the last months of 2015, several European countries have been lobbying to enhance the regulatory restrictions surrounding fluorine derivatives. Many of us have been fearing an aggravation of restrictions on the use of fluorine derivatives in extinguishing equipment. Fluorine – A hardly replaceable omnipresent ingredient. Fluorine is used in numerous applications, be it in the development of fire fighting foams or quite broadly in applications relating to our daily comfort (surface treatments, packaging, paints…). For recollection, Fluorine is a most active chemical element which enables the formulation of high performance extinguishers that are stable, low cost, without any real alternative till today. Fluorine free extinguishing products are being developed, but operational difficulties, poor performance and high cost are hindering the development of those technologies on a large scale. Best fluorine free extinguishers are still far from meeting the cost/performance of fluorine based extinguishers and their long term reliability remains to be proven. Fluorine – Recovery and Recycling. 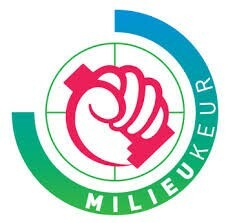 UNITEQ’s bet! Maintenance and dismantling of the extinguisher – two sensitive phases! Only a 2% fraction of extinguishers is being operated to fight a fire. The extinguisher remains nevertheless the best approach to anticipate and successfully fight an emerging fire. 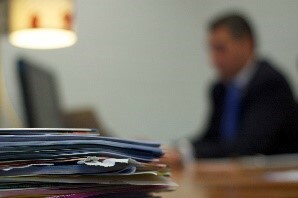 There is therefore an imperative, total performance expectation at any point in time. Preventive maintenance or the dismantling of the extinguisher are the main potential sources of an eventual pollution. UNITEQ proposes to the sector to rethink the extinguisher by incorporating in its conception the notions of recovery and recycling. Recycling and encapsulation: the « separate container » solution. As far as foam extinguishers are concerned, there are two situations: either the extinguishing load is premixed or the fluorinated part of this load is kept separate in a dedicated container and released exclusively when the extinguisher is being operated. Whenever the fluorinated part of the load is kept separate, it is easy to recover the container and to replace the two loads by new ones. The separate treatment of the fluorine free and of the fluorine bearing ingredients is considerably simplified and the recycling becomes economical. Fluorine – More recyclability and less regulatory pressure! The regulatory pressure on fluorine relates in part to the good practices put in place by the actors of the sector with respect to the maintenance and recycling of spent chemicals in the unused 98% fraction of extinguishers. UNITEQ conviction is that the future of fluorine resides in the encapsulation of the product. 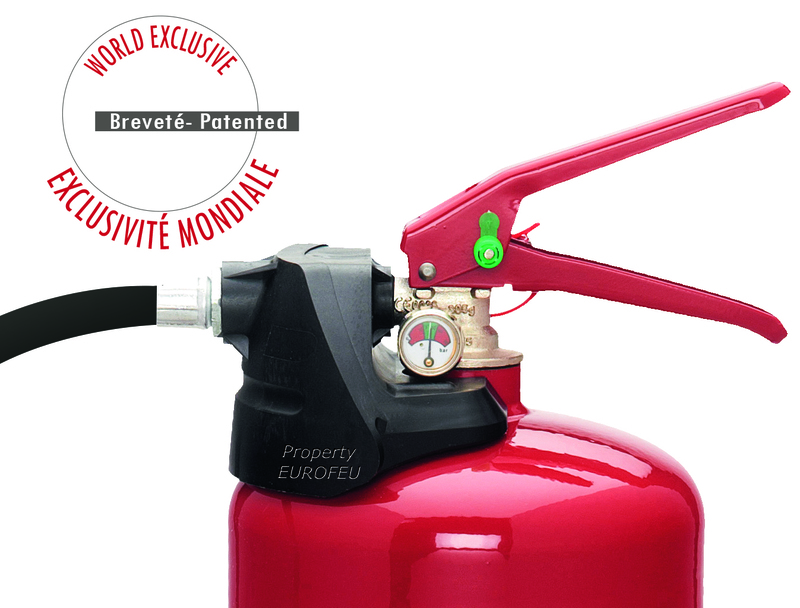 We believe that extinguishers bearing separated fluorine derivatives represent the immediate future of extinguishers. This technology is already available in permanent pressure extinguishers or in systems with auxiliary pressure. It represents a good practice which shall help the sector and should contribute to moderate the regulatory pressure on fluorine. 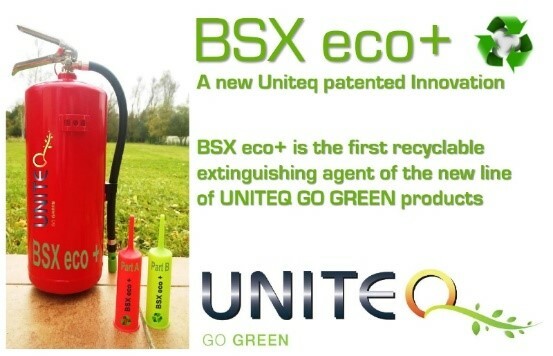 UNITEQ shall launch in 2016 a range of high performance products « UNITEQ go green » bearing environmental claims, among which BSX eco+, a recyclable extinguishing product. This is a patented concept enabling a clean and innovative approach through the recovery and valorization of the extinguishing load at the end of its lifetime. Tomorrow’s extinguisher, focus on a predictable market! 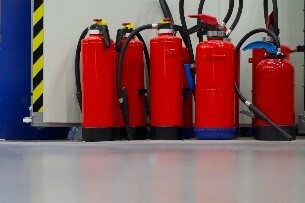 The foam extinguisher market is developing because it fulfills a real demand. This underlying trend should continue. The premixed permanent pressure extinguisher meets in priority tight cost/performance criteria. This type of equipment shall almost certainly evolve into one with a separate container, for a clean management of fluorinated derivatives, which could be isolated at the end of the useful life of the extinguisher. The extinguisher equipped with an auxiliary pressure shall continue its progression. It is easier to maintain whilst enabling good environmental practices thanks to its cartridges holding the active chemicals.